Phil Cowen (second left, Rangers community football executive) celebrates the launch of Glasgow Rangers' friendly next month against Portadown at Shamrock Park. Also included, from left, are Portadown's Bill Emerson (club secretary), Ronnie Stinson (club chairman) and Niall Currie (manager). Rangers have confirmed a second summer friendly date in Northern Ireland - with the July trip to tackle Portadown an extended show of appreciation towards the country’s loyal fanbase. The Ports match at Shamrock Park on Saturday, July 22 arrives four days after Rangers face Ards and the double delight for the local supporters serves as a mark of thanks from the Glasgow giants. “Portadown’s stature and history helped attract us to the club and, of course, the fanbase Rangers enjoy within the County Armagh area,” said Rangers community football executive Phil Cowen. “The fans have continued to come across to Scotland on matchdays from Northern Ireland and, in particular County Armagh, despite our recent troubled times. “So, from that viewpoint, it is nice to give something back to those supporters and it is going to offer a competitive fixture for us at a club good to work with in Portadown. “There are so many fans in this area so it is something of an honour for the young players to come across from Scotland and wear the Rangers shirt in front of supporters in Northern Ireland. “The gaffer is signing on a regular basis at the minute so, in terms of players coming over, it is a Rangers XI. “We have a lot of talented young players from the under 20s, with maybe eight or nine having made first-team debuts of course last season. Ports boss Niall Currie has secured a string of summer signings within his first pre-season campaign as Shamrock Park manager. His focus remains on next season’s promotion challenge out of the Championship and Currie considers the Rangers date key to his work beyond any anticipated financial boost. “Both sets of squads will look on it as an important fixture and I’m expecting a really competitive game given when it falls in the pre-season calendar,” said Currie. “First and foremost, that is the appeal for me as Portadown manager but obviously everyone connected to the club is excited to see Glasgow Rangers players out on the pitch at Shamrock Park. “It is a big day for our club and players and we want to show our fans something with a good performance. 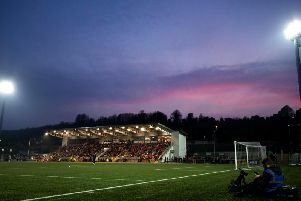 Portadown chairman Ronnie Stinson was recently confirmed at the head of a revamped Board of Directors inside Shamrock Park tasked with the responsibility of rebuilding a club tarnished across the past few years with off-the-field financial issues, Irish Football Association-imposed fines and a transfer embargo which all resulted in relegation last season out of the Premiership division. “This summer is a clean start for Portadown in many ways after such a tough time and it is exciting to have a club the size of Rangers work with us towards putting on this friendly,” said Stinson. “It is a boost for the club but also a chance to reach out beyond our normal fanbase given Rangers’ popularity in the country and area. Tickets will go on sale this Friday at the cost of £10 (adult) and £5 (concession) from the following initial outlets: Wright’s Filling Station, Laurelvale Post Office, Village Inn (Markethill), JD Tipler’s, Gary’s Bar, Portadown Carpet Centre, Ye Olde House Bar (Richhill).